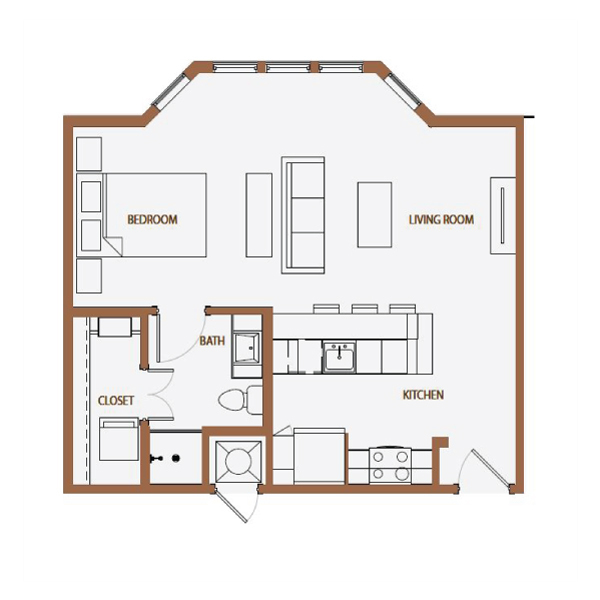 The Kelton at Clearfork offers studio, one, two and three bedroom living options. Search below to find the perfect size and layout that fits your needs. Because we know pets are an important part of a family, The Kelton at Clearfork is a pet-friendly community. When you visit the Web Site, we automatically collect certain information about your activities ("Web Site Usage Information"). Web Site Usage Information is information about how our visitors use and navigate the Web Site. This includes, for example, the number and frequency of visitors to each web page, the length of their stays, the type of browser each visitor is using to view the Web Site (for example, Internet Explorer, Firefox), the type of operating system each visitor is using, (for example, Windows XP, Mac OS), the domain name of each visitor's Internet service provider (for example, America Online, Earthlink), the visitor's IP address, the address (or "URL") of the web site that the visitor came from before visiting the Web Site, which pages were visited on the Web Site, what was clicked on, and certain other available information. An IP address is a number that is automatically assigned to your computer whenever you access the Internet, which our web servers use to identify where to send the information your computer requests. When you request pages from the Web Site, our servers log your IP address as well as information about your activities on those pages. To collect this Web Site Usage Information, the Web Site and any e-mails sent to you by the Web Site (or otherwise by The Kelton) may utilize cookies, web beacons, embedded scripts or similar technologies. The Kelton may also collect Personal Information from you through means other than the Web Site. This may include offline collection, such as when you submit a paper application to rent an apartment, make a rent payment by check, or call or visit the management office at The Kelton property. It may also include e-mails that you send to us separate from the Web Site. We retain and use Personal Information to: (1) provide you with services or process transactions that you have requested; (2) communicate with you regarding information, features or offers that we believe will be of interest to you; (3) respond to your questions or other requests; (4) contact you with regard to the Web Site; (5) process any applications, payments or changes to your account information; (6) process other information or Personal Information that you submit through the Web Site; (7) conduct user surveys; (8) contact you regarding a sweepstakes, contest or promotion in which you have participated, and (9) fulfill other purposes disclosed at the time you provide your Personal Information. We may also use the information you provide to improve the Web Site or The Keltons services, to customize your experience on the Web Site, to serve you specific content, or for other business purposes. This web site, and the information, content and services it makes available (which, collectively are referred to as the "Web Site"), is provided to you by The Kelton and its affiliates, subsidiaries and related entities ("The Kelton" or "we" or "us"). These Terms and Conditions of Use ("Terms") set forth the terms and conditions governing your use of the Web Site. In addition to these Terms, we may also post additional terms and conditions ("Additional Terms") that apply to certain services or features we offer on this Web Site (such as payment services, sweepstakes, contests, message boards, chat rooms, blogs, etc. ), and you will be subject to such additional guidelines when you access these services or features. To the extent there is a conflict between these Terms and any Additional Terms, the Additional Terms will control, unless the Additional Terms expressly state that these Terms will control. This Web Site contains a variety of information and content, including: (1) copyrighted material, such as information, text, directories, graphics, photographs, illustrations, floor plans, maps, images, video and audio clips, sound clips, advertising and promotional materials, data, software, compilations, designs, graphical interface, and overall "look and feel," (2) trademarks, logos, trade names, service marks, and trade identities, whether registered or unregistered (collectively the "Trademarks"), and (3) other forms of information and intellectual property (all of the foregoing collectively and individually are referred to as "Content"). All right, title, and interest in and to the Content available via the Web Site is the property of The Kelton or its licensors, and is protected by U.S. and international copyright, trademark, patent, or other proprietary rights and laws. You may not copy or otherwise use any of the Content except as expressly authorized by these Terms. While we strive to keep the Content that we post on the Web Site accurate, complete, and up-to-date, we cannot and do not guarantee, represent or warrant that any of the Content on this Web Site is accurate, complete, timely or applicable to you. You agree to use the Web Site solely for lawful purposes, and you agree that you shall at all times comply with all applicable laws, statutes, rules, regulations, ordinances and the like applicable to your use of the Web Site. We grant you a nonexclusive, nontransferable, revocable, limited license to view, download, copy, and print Content retrieved from the Web Site only for your personal use. Except to the minimum extent otherwise expressly permitted under applicable law, you may not use any Content available via the Web Site in any other manner or for any other purpose without the prior express written permission of The Kelton. Any unauthorized use of any Content from the Web Site may violate copyright laws, trademark laws, privacy laws and/or other laws or regulations. Certain areas of the Web Site may require registration or may otherwise ask you to provide information in order to participate in certain features, to access certain Content, or to obtain certain services (including "Online Applications and Leasing" below). The decision to register and provide this information is purely voluntary and optional; however, if you elect not to register or provide such information, you may not be able to utilize such portions of the Web Site. If you register with the Web Site, you agree to provide true, accurate, current, and complete information about yourself, and where required, to maintain and update it promptly to keep it true, accurate, current and complete. Any sweepstakes, contests or other promotions ("Promotions") that may be offered via the Web Site will be governed by a separate set of rules that, in addition to describing such Promotion, may have eligibility requirements, such as certain age or geographic area restrictions, terms and conditions governing the Promotion, use of submissions you make, and disclosures about how your personal information may be used. It is your responsibility to read such rules to determine whether or not you are eligible and want to participate, register and/or enter, and to determine the applicable terms and conditions of the Promotion. By participating in any Promotion, you will become subject to those official rules, and you agree to comply with and abide by such rules and the decisions of the sponsor(s) identified therein, which shall be final and binding in all respects. The Web Site may provide links to other web sites and/or resources (including advertisements) that we do not maintain or which are not under our control ("Third Party Web Sites"). Your dealings with such Third Party Web Sites are solely between you and such third parties. We are not responsible for, and we make no representations or warranties with respect to, the content, products, services, personal information practices, ownership, or legality of any such linked Third Party Web Site unless expressly stated by us. Your use of such Third Party Web Sites is subject to the terms and conditions established by such third parties, and we encourage you to review their user terms and privacy policies before you use their services. Your access to and use of such Third Party Web Sites is solely at your own risk, and you agree that we will not be responsible or liable for any loss or damage of any sort that you may suffer as the result of your dealings with such Third Party Web Sites. YOU UNDERSTAND AND AGREE THAT THE WEB SITE AND ALL CONTENT ON IT IS PROVIDED ON AN "AS IS," "AS AVAILABLE," BASIS "WITH ALL FAULTS" AND WITHOUT WARRANTIES OF ANY KIND, EITHER EXPRESS OR IMPLIED. TO THE FULLEST EXTENT PERMITTED BY APPLICABLE LAW, THE KELTON EXPRESSLY DISCLAIMS ALL WARRANTIES, REPRESENTATIONS, AND UNDERTAKINGS OF ANY KIND, WHETHER EXPRESS OR IMPLIED, INCLUDING, WITHOUT LIMITATION, ANY WARRANTIES OF TITLE, MERCHANTABILITY, FITNESS FOR A PARTICULAR PURPOSE, AND NONINFRINGEMENT. SOME JURISDICTIONS DO NOT PERMIT THE EXCLUSION OF IMPLIED WARRANTIES, SO THE ABOVE EXCLUSION MAY NOT APPLY TO YOU. YOU MAY HAVE OTHER RIGHTS WHICH VARY BY JURISDICTION. TO THE FULLEST EXTENT ALLOWED BY APPLICABLE LAW, YOU AGREE THAT THE KELTON IS NOT LIABLE TO YOU FOR ANY LOSS OR DAMAGES OF ANY KIND (INCLUDING, WITHOUT LIMITATION, ANY DIRECT, SPECIAL, INDIRECT, INCIDENTAL, EXEMPLARY, CONSEQUENTIAL, ECONOMIC, OR PUNITIVE DAMAGES OR DAMAGES DUE TO LOST PROFITS), WHETHER BASED IN TORT, CONTRACT, STRICT LIABILITY OR OTHERWISE INCLUDING, WITHOUT LIMITATION, ANY LOSS OR DAMAGES ARISING OUT OF OR IN ANY WAY CONNECTED WITH OR RELATING TO YOUR USE OF THIS WEB SITE OR WITH THE DELAY OR INABILITY TO USE THIS WEB SITE, OR FOR ANY INFORMATION, CONTENT, PRODUCTS, AND/OR SERVICES OBTAINED THROUGH THIS WEB SITE, OR OTHERWISE ARISING OUT OF THE USE OF THIS WEB SITE, EVEN IF THE KELTON HAS BEEN ADVISED OF THE POSSIBILITY OF SUCH DAMAGES. IN NO EVENT AND UNDER NO CIRCUMSTANCES WILL THE KELTON BE LIABLE TO YOU FOR ANY REASON OR ANY CAUSE OF ACTION WHATSOEVER IN AN AMOUNT GREATER THAN $10. The Kelton reserves the right, in its sole discretion, to modify or discontinue the Web Site, or any portion of the Web Site, without notice to you or any third party. We also may, in our sole discretion, refuse or restrict anyone from access to the entire Web Site or any portion of the Web Site. Any violation of these Terms (as determined by The Kelton in its sole discretion) may result in restriction or termination of your access to all or part of the Web Site and may be referred to law enforcement authorities. No waiver of any of these Terms shall be of any force or effect unless made in writing and signed by a duly authorized officer of The Kelton. If you have any questions or concerns with respect to these Terms or the Web Site you may contact our webmaster by e-mail at info@thekelton.com.